Late for church, during Seven Chances (1925) Buster Keaton must marry by 7:00 p.m. that evening in order to inherit a fortune. But what time is it? Having just lost his pocket watch down a sewer drain, Buster stops in a clock shop for help, only to realize every timepiece in the store tells a unique story. When all seems lost, providence intercedes on Buster’s behalf. A woozy drunkard, enraged by his ringing alarm clock, tosses it out the window, where it conveniently konks Buster on the head, reminding him of the correct time. You never know what you’ll find just by keeping your eyes open. When I was in SoCal last month to introduce The Great Dictator at the Alex Theater in Glendale, I happened to drive along Franklin Avenue towards Hollywood, when passing the corner of Cheremoya, I noticed what seemed to be a familiar corner. I made a note to remember the spot, and when I returned home, checked my Seven Chances Blu-ray, and ta-dah! It was the correct spot. Keaton was bonked on the head beside the Cheremoya apartments, completed in 1924 at 5987 Franklin, at the NE corner of Cheremoya. With this discovery I’m close to uncovering nearly every location from the film – many new discoveries are documented in other posts HERE, and in my book Silent Echoes. Thanks Rena Kiehn for the current “now” photo. My all time favorite location – the late Mrs. Eleanor Keaton on the steps of the Seven Chances church at 2610 La Salle Avenue. The Cheremoya Apartments at the corner of Franklin. 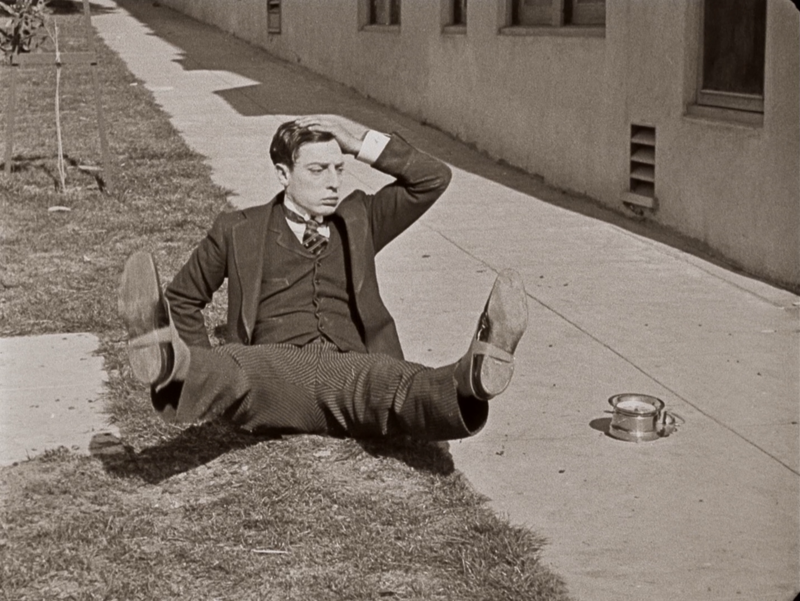 This entry was posted in Buster Keaton, Seven Chances and tagged Buster Keaton, Hollywood, Keaton Locations, Seven Chances, Silent Comedians, Silent Comedies, Silent Movie Locations, Silent Movies, then and now. Bookmark the permalink. Incredible when it hits you. Well done, as always. I know that corner and that whole area there like the back of my hand. Wow. I lived on Beachwood Canyon 4 times. Thanks Javi. They filmed so much there’s old movie history everywhere around Hollywood. That site is almost completely unchanged. even the small piece of concrete in the grass to busters right is still in situ, and it even appears like the tree behind him was just a baby when he filmed there!